They called him “The Blazer.” As a minor leaguer he drew comparisons to Jackie Robinson. Don Blasingame wasn’t as talented as Robinson, but he was good enough to play 12 years in the major leagues, with appearances in an All-Star Game and a World Series. He married a Miss America finalist, who was the daughter of a famous baseball player. He set a major-league record of which he justly could be proud. When his major-league playing days were over, he went to a far-off land and played, coached or managed baseball for 16 years. Don Blasingame’s life was truly a baseball life. Don Lee Blasingame was born on March 16, 1932, in Corinth, Alcorn County, in northern Mississippi, very near the Tennessee state line. He was the fourth child (the third son) of Tennessee natives Ottie May (nee Milstead) and Chester Henry “Doc” Blasingame. During Don’s childhood his father was a butcher at a retail meat market in West Corinth, Mississippi. Don was an outstanding baseball player for the Corinth High School Warriors and starred for the Corinth American Legion Post 6. According to The Sporting News the Houston Buffaloes, a St. Louis Cardinals farm team, gave him a trial during spring training in 1951.1 However, he joined the United States Army before the baseball season began. He served in the military in 1951-1952. Before the 1953 baseball season began he signed with the Cardinals as an amateur free agent. The Cardinals assigned Blasingame, a shortstop, to the Winston-Salem Cardinals of the Class B Carolina League. He performed well enough in Carolina to earn a promotion to the Houston Buffaloes of the Class AA Texas League in 1954. The left-handed hitting Blasingame hit .315 and stole 34 bases for the Buffaloes in 1934. His stolen base total was his best in any season, either in the minors or the majors. During the off-seasons of 1953 and 1954 Blasingame attended David Lipscomb College in Nashville, Tennessee. However he must not have had much time for classes after the 1954 season, for Houston won the Texas League pennant that year and played the Atlanta Crackers, champions of the Southern Association, in the Dixie Series, which didn’t end until September 28. Then in early October Blasingame went off to Cuba to play in the Cuban Winter League. The Cardinals assigned him to the Havana Reds, owned by Mike Gonzales and managed by Adolfo Luque, both former major league stars. Gallagher compared the relative merits of Blasingame and Boyer: “Boyer lacks the dash, fire and color of Blasingame but may be more prepared for a big league shot at this time than the flashy, lefthanded batting shortstop (Blasingame).”9 The writer was correct in his assessment of their readiness for the big time. Boyer became the Cardinals regular third baseman in 1955 and went on to become regarded as one of the all-time great third-sackers. Blasingame became a big-league regular a year later and had a respected journeyman career, but his star never shined quite so brightly as Boyer’s. Blasingame spent most of the 1955 season with the Omaha Cardinals in the Class AAA American Association. A September call-up, he made his major-league debut on September 20, 1955, at the age of 23. The 5-foot-10, 165 pound second baseman batted left-handed even though he threw from the starboard side. In his first game he batted leadoff as the Cardinals faced Sam “Toothpick” Jones and the Chicago Cubs at Busch Stadium. In his first career at-bat he beat out an infield single and scored on a home run by Solly Hemus. In the second inning he drew a base on balls, but was caught attempting to steal. In the fifth inning he grounded out to second base. In the seventh inning he drew another walk. This time he didn’t attempt to steal. Although he hadn’t hit a ball out of the infield all day, his batting line didn’t look bad – one-for-two, with two walks, a run scored, and a batting average of .500. In 1958 Blasingame was selected for the All-Star Game. Although future Hall of Famer Bill Mazeroski played the entire game at second base, Blasingame got into the game. He pinch-hit for pitcher Warren Spahn in the fourth inning and flied out to center field. On December 15, 1959, the Cardinals traded Blasingame to the San Francisco Giants for second baseman Daryl Spencer and left-fielder Leon Wagner. Blasingame did not fare too well in his one season in the City by the Bay, hitting only .235. 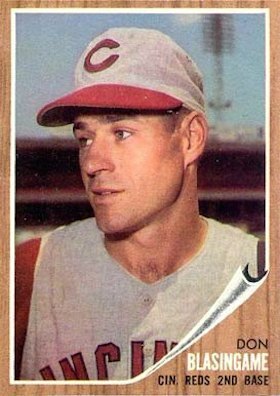 On April 27, 1961, the Giants traded him along with catcher Bob Schmidt and pitcher Sherman Jones to the Cincinnati Reds for catcher Ed Bailey. In 1961 Blasingame’s batting average plunged to a career-low .222, but he held on to his second base position, playing 116 games at the keystone to 43 games by the young Venezuelan, Elio Chacon. Led by MVP Frank Robinson and the league leader in base hits, Vada Pinson, plus excellent pitching, the Reds won their first pennant in 21 years. For the first and only time in his career, Blasingame was able to play in a World Series. He did not cover himself with glory in the fall classic. He started Game 1, batted leadoff as usual, and went 0-for-3, striking out twice. He sat out Game 2 as Chacon played second base. Chacon also started Game 3, but was lifted for pinch-hitter Jerry Lynch in the seventh inning. When Lynch received an intentional base on balls, Blasingame entered the game as a pinch-runner, but did not score. Chacon played second base in Game 4. Blasingame started Game 5. He led off the third inning with a single to center field and scored on a home run by Robinson. Blasingame was lifted for a pinch-hitter in the ninth inning. He ended the series with only one hit and one run scored, as the Yankees won the series in five games. In 1962 Blasingame made a strong comeback. He hit .281 in 141 games. However he did not get off to a good start in 1963, hitting only .161 in 18 games and losing his second base job to a rookie named Peter Edward Rose. On July 1 the Reds traded Blasingame to the Washington Senators for pitcher Jim Coates. He played parts of four seasons in the nation’s capital. On August 2, 1966, he was purchased by the Kansas City Athletics, but played only 12 games for the A’s. He played his last major-league game on August 27, 1966, at Anaheim Stadium. He pinch hit for pitcher Wes Stock in the seventh inning and drove a Minnie Rojas pitch into center field for a base hit in his last major-league at-bat. His day ended when he was thrown out trying to steal second base. On September 7, Kansas City released him and his major-league career was over at the age of 34. At the time of his retirement Blasingame had hit into fewer double plays per times at bat than any other major leaguer in history.11 This was statistical confirmation of his well-earned reputation as one of baseball’s best bunters and spray hitters. Blasingame’s release by the Athletics ended one chapter of his baseball career, but it opened the door to a second chapter, which ran for another 14 years. In 1967 he joined the Nankai Hawks of the Japan Pacific League. Known in Japan as Don Blazer, he played second base for Nankai for the next three years, and then joined the Hawks’ coaching staff for eight years. In 1978 he coached for the Hiroshima Toyo Carp. Then in 1980 and the first part of 1981 he managed the Hanshin Tigers. In midseason 1981 he returned to Nankai and managed the Hawks the rest of that year and during 1982. For all those years Blasingame and his wife and children spent half the year in Japan and half in the United States. After it was all over, Blazer said living in Japan was a good experience. “We lived in an international community. The kids made friends from all over the world that they still hear from.”15 The Blasingame youngsters learned to speak fluent Japanese. Blazer’s family consisted his wife Sara and five children, sons Kent, Brent, and Greg and daughters Dawn and Cindy. He had married flight attendant Sara Ann Cooper in 1960. She was the daughter of star National League catcher Walker Cooper and a niece of noted pitcher Mort Cooper. (Blasingame and his father-in-law had been teammates on the St. Louis Cardinals in 1956-57.) Sara was crowned Miss Missouri in 1957 and made it to the final ten in the Miss America pageant. She won the preliminary talent competition at Atlantic City with her Charleston dance. One of their sons, Kent, played three seasons of minor-league baseball. Like his father, he was a leadoff batter. His Japanese language fluency came in handy when he later became an Asian scout for the Colorado Rockies. Don Lee Blasingame was buried in the Paradise Memorial Gardens in Scottsdale. For nearly 40 years he had played, coached, or managed baseball on two continents. The Blazer truly loved the game. 1 The Sporting News, June 30, 1954. 2 Ibid., March 31, 1954. 3 Ibid., June 30, 1954. 4 Ibid., June 16, 1954. 7 Ibid., October 13, 1954. 8 Ibid., October 27, 1954. 9 Ibid., January 19, 1955. 10 Fielding wins is defined as the “total number of wins the team achieved through its fielding compared to the average team in the context of the offensive level of the league and the team’s home park.” Pete Palmer and Gary Gillette, The Baseball Encyclopedia, (New York: Barnes and Noble, 2004.) 1356. 11 Daily Journal (Corinth, MS), April 14, 2005. 12 The Sporting News, November 25, 1967. 15 Articles.philly.com./sports, February 24, 1995. 16 Daily Journal,(Corinth, MS), April 14, 2005.